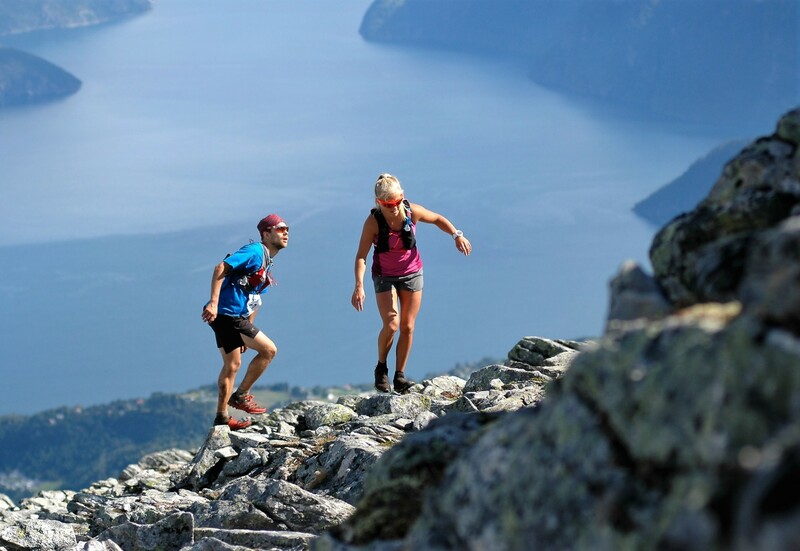 Stranda Fjord Trail Race is 48km and gives you awesome fjord views, flowy trails, long ascents and descents, and technical parts. Do you take he challange? The race starts in Opshaug (100masl) The first three kilometers of the race is on a gravel road before the course continues on the hiking trail up to Lievarden (799masl). From Lievarden the course continues on the ridge high above the fjord to Duklidalen. In Duklidalen the real climb of vertical meters begins as the course gets steeper up towards Mønet (1058 masl). You will need to use your hands on some parts of the course here. On Mønet you have en extraordinay view of the fjord as you are standing 1000m straight above it. Here the course starts to get even more rugged and alpine, as the course is on scree and slab on the way up to Fremste Blåhornet(1478masl), and further over Heimste Blåhornet(1336masl). The running on this part of the trail is technical both ascending and descending. After the technical descent down the ridge of Heimste Blåhornet the course comes to the first food station and continues on trail towards Rødsethornet(1178). This section of the course is brand new for the 2019 edition. On Rødsethornet the course follows a technical trail on the ridge with great views towards the Stranda valley and the surrounding mountains. The course continues down from Rødsethornet towards Vardnakken(878masl). 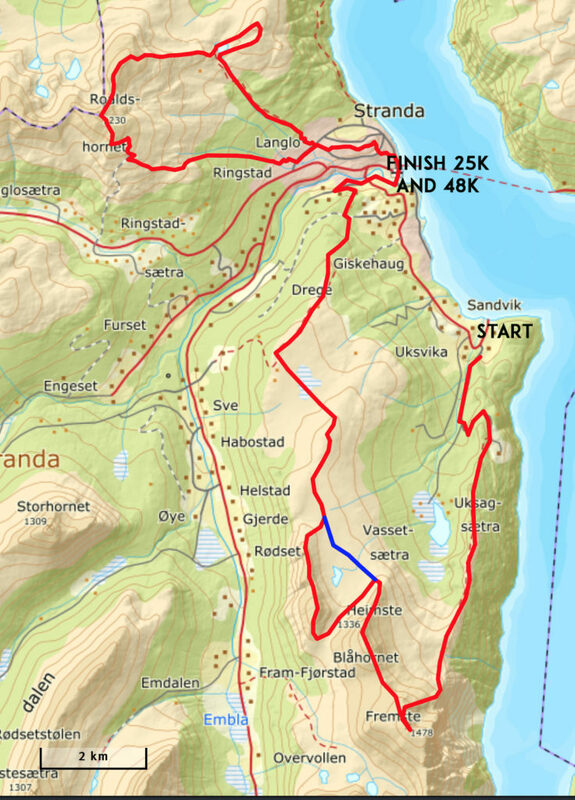 From Vardnakken the course goes over a marsh to Dregetua(693masl). From Dregetua the course continues on a flowy hiking trail down to Stranda and sea level. The last bit down to Stranda is on a asphalt road. In Stranda the course goes through the «Skinkerådhus» where we also have a food station. From the square in Stranda the course continues on various small roads up to Storgjerdet where the course continues on a hiking trail up to mt. Roaldshorn (1230masl), this is a new section for the 2019 edition, passing the Fjord Panorama Restaurant on the way, where there´s a food station. From Roaldshorn the viw down to Stranda and the fjord is just epic, and the course descends down toward Trollvardegga (1094masl) and down to Skurdavatnet(630masl) on a technical trail. 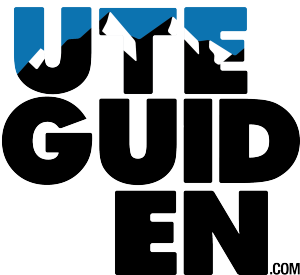 From Skurdavatnet the course climbs up off trail to Skurdahornet(899masl) on a section that´s also new for the 2019 edition. From Skurdahornet the course descents down to Skurdavatnet(630masl) on a techinical trail and then continues down to Langlo on a flowy trail. From Langlo the course follows various smaller roads, asphalt and gravel down to the finish line in Stranda. Food stations: 4 and there´s rivers and streams where you can refill water along the course. The registration closes on 01.08.2018 or when it´s full. We have 300 spots on this race in total. What´s included in the starting fee?